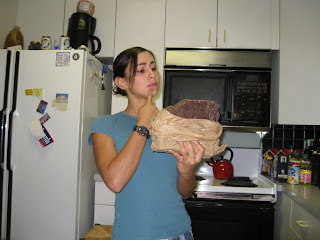 Last Thursday I had the opportunity to consume delicious chocolate in the company of a dozen or so eco-minded women. Once a month, the DC Eco-Women group holds a mini book club. Yes, you heard right; we in the Nation's Capitol like our reading material in brief or memo format. Held at Scrap DC, the evening discussion tackled one of my favorite topics, chocolate. And not just any chocolate, but the environmentally and socially responsible. Ah, the readings (and viewings). The Green America Blog reported on the recent announcement from Hershey Company that it plans to reach 100% certified cocoa by 2020. While it's unclear what that really means, and it could be a step in the right direction, the blog implores Hershey to go further, strive for Fair Trade certification, and address the child labor and slavery issues in its supply chain. Fair Trade Your Supermarket addresses the consumer side of the ethical chocolate consumption. And finally, check out the BBC special on child trafficking the chocolate industry. With this as our base and some serious Divine Chocolate on the table, we delved into the details on Fair Trade chocolate. Ok, so first of all, what does it actually mean to be Fair Trade? And what is the difference between that and some other certifications? According to the Divine representative, the major distinguishing characteristic of Fair Trade is the child labor and equitable wage standards. And while there are some criteria for environmental performance, certifications such as Rainforest Alliance and Organic make this their focal point. In choosing a bar with a label, it all comes down to what your priorities are. That's all well and good, but what about the big companies - Hershey, Kraft, Nestle, Mars, Cadbury? Do their pledges to source only "certified" cocoa hold many beans of truth? How guilty should I feel about Halloween? This was a more sobering conversation. Yes, commitments by such big players in the food and ag world are important strides. However, it is unclear whether by some distant date in the future, these commitments will actually be kept. 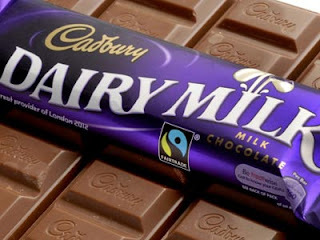 Cadbury, for one, has moved forward with Fair Trade across the brand. If not Hershey, then what? We subsequently moved onto how our favorite bars fare. Endangered Species Chocolate, with the cute cuddly animals all over the wrapping, has no certification and an ambiguous claim to donate money to conservation. Sadness. Chocolove has pretty wrapping, sappy love poems, and absolutely no declaration of any kind about ethical inclination. Disappointing, but not unexpected. Green and Black's, a UK brand, has good intentions and is moving toward Fair Trade. Theo Chocolate and Madecasse (you can guess whose favorite those are...) we already know and love. Divine, which was our confection of the evening, sources Fair Trade and from cooperatively-owned cocoa. Hopefully, we'll have a deeper look at them in the near future! These are tough questions, especially since a company that does well in one area (say, environmentalism) might still fail in other areas (like human rights). I've been using the Food Empowerment Project's slavery-free chocolate list (http://www.foodispower.org/chocolatelist.php) as a general guide, but I still don't feel great about this since I'm not sure about all these companies' commitments to the environment.